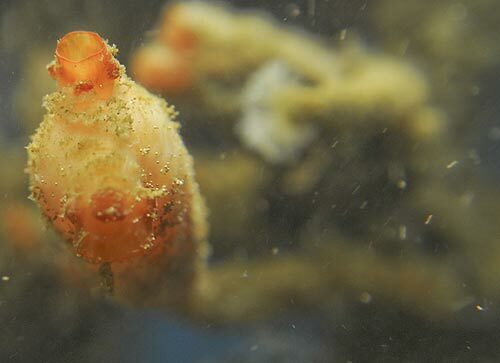 Case in point: some creatures at the Seaside Aquarium are living on a rope, quite literally. 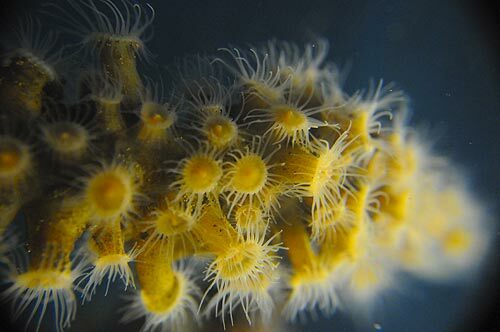 Tunicates, zoanthids, tubeworms and mussels sometimes show up as small colonies at the Seaside Aquarium on the north Oregon coast, and recently aquarium specialist Tiffany Boothe noticed a piece of rope had turned into prime real estate. 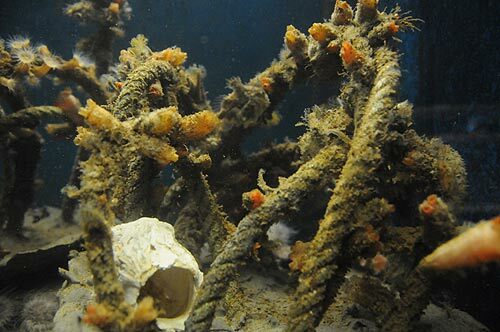 On it, she found tunicates, zoanthids, tubeworms, and mussels. Talk about an oceanfront view – except these are inside a tank in the Seaside Aquarium. Zoanthids are anemone-like critters that live in groups and clusters. The individuals can connect to each other and make colonies through a sheet of tissue at the bottom of each creature. If they're disturbed or threatened somehow they contract their tentacles, and it can take hours before the zoanthids calm down and expand again. 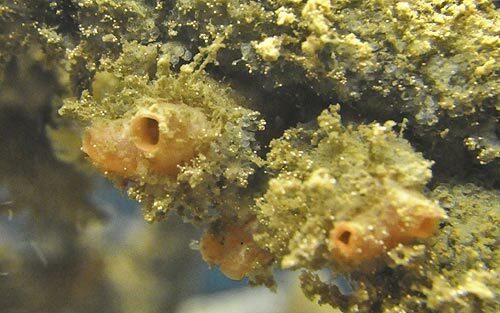 Boothe said tunicates belong to the same phylum as vertebrates. Adults don't have a backbone, but as larvae they start off with a tail, a dorsal nerve cord, and a structure called a notochord that stiffens their body – but it's not actually composed of bone. Here's the creepy kicker: because of these features they are considered a bit more closely related to fish and people. 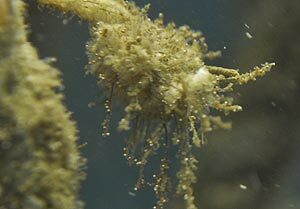 Tubeworms are generally marine worms found swimming inside of a tube, which is created by secreting a calcium substance that makes a hardened structure around their bodies. But some others, like the ones seen in the photos from the Seaside Aquarium, have a more flexible see-through structure that's akin to a human fingernail. California Mussels start off their lives as free-swimming plankton, spending anywhere from one to three months floating along the ocean’s currents and feeding on phytoplankton. It suddenly forms a shell and gravity pulls it down to the ocean floor, where it eventually finds a home by traveling on a single foot-like feature. It attaches itself securely to any hard surface by a liquid adhesive that travels down its foot, and the cold sea water does the rest of the job of hardening this glue. They can live in the same spot for 20 years. 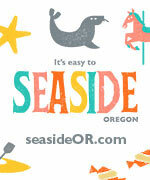 More about this part of the north Oregon coast at the Seaside Virtual Tour, Map. Seaside Aquarium is on the Prom in Seaside. 503-738-6211..
Below: more amazing creatures in Seaside Aquarium tanks.